A taxpayer may want to file his income tax return for reporting his income for a financial year, carrying forward losses, claiming an income tax refund etc. An income tax return is a form which enables a taxpayer to declare his income, expenses, tax deductions, investments, taxes etc. The Income Tax Act, 1961 makes it mandatory under various scenarios for a taxpayer to file an income tax return. The Income Tax Department provides the facility for electronic filing (e-filing) of an income tax return. Before discussing the steps involved in the e-filing of an income tax return, it is essential for a taxpayer to have the necessary documents at the ready. As a first step, the taxpayer needs to calculate his income as per the income tax law provisions applicable to him. Secondly, the taxpayer should summarise his TDS amount from the TDS certificates received by him for all the 4 Quarters of the financial year. Form 26AS helps the taxpayer in summarising the same. For the purpose of filing an income tax return, a taxpayer should have a login (your PAN is your login id) and password. 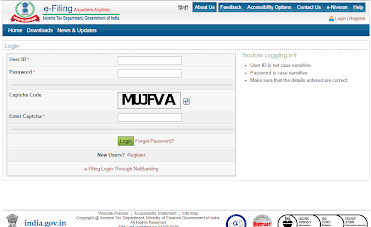 In case of first-time filers, they can create a login sign up using their PAN, Aadhaar number, mobile number and address to create an e-filing account on the income tax portal. The taxpayer has to ascertain the income tax form/ ITR applicable for filing his income tax return. After ascertaining the income tax form, the taxpayer can proceed with the filling of the income tax return. 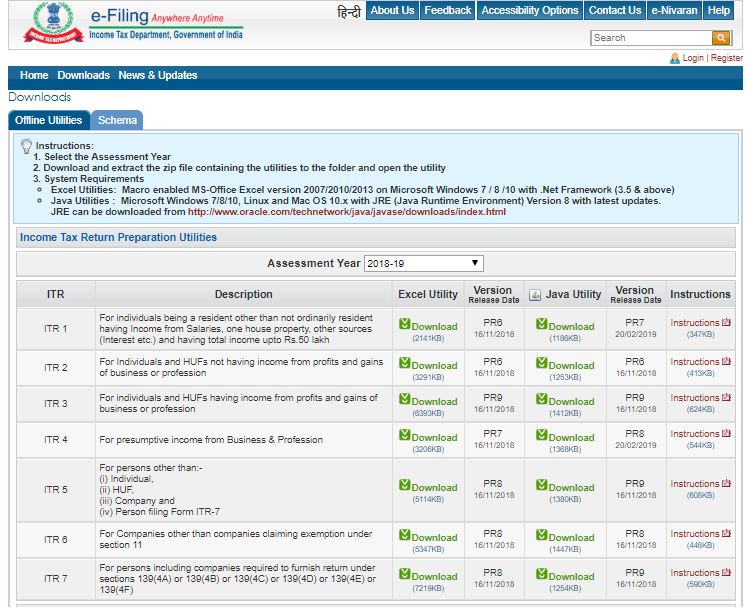 The taxpayer can download the ITR preparation software from the Income tax website as relevant to the income tax form. Using the ITR preparation utilities and the calculation made under Step 1, the taxpayer can fill in the form and ascertain tax payable/ refund due. The income tax due can be paid online and the details of the challan filled in the income tax form. The income tax return data can be downloaded in an XML format. a. The general information sheet as shown below will have to be filled by the taxpayer. The taxpayer has to enter the data in the green coloured cells, and the cells with text in red colour have to be mandatorily filled. b. Further, the details of the income as calculated in Step 1 has to be filled in by the taxpayer. As a taxpayer fills the sheet, some of the cells will automatically pick up data from the previously added information. c. The taxpayer should click the ‘validate’ button on the right corner of the XML utility. This button will ensure that all the relevant fields of the return form are filled. Once, those required sections are filled, only then the taxpayer can proceed to generate an XML to file his ITR. 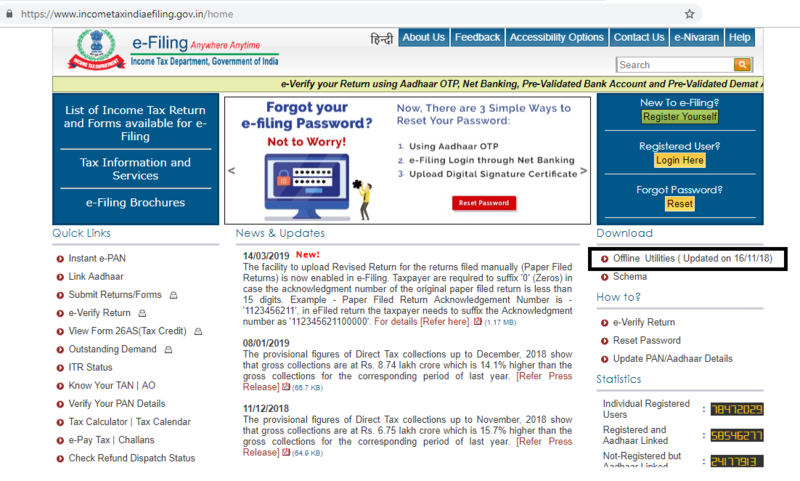 c. After clicking the ‘Income Tax Return’ option, the website will direct you to the page where the taxpayer will be required to enter details on the relevant assessment year, ITR form name, submission mode. d. The mode of verification can be chosen, whether Aadhaar OTP, electronic verification code (EVC) or manually signed copy of ITR V (acknowledgement) which is to be sent by post to CPC, Bengaluru. 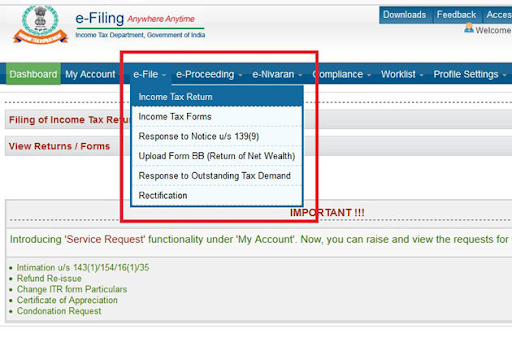 e. In the next step, the taxpayer needs to attach the ITR XML file using the browse button. Upload the file and click on submit. 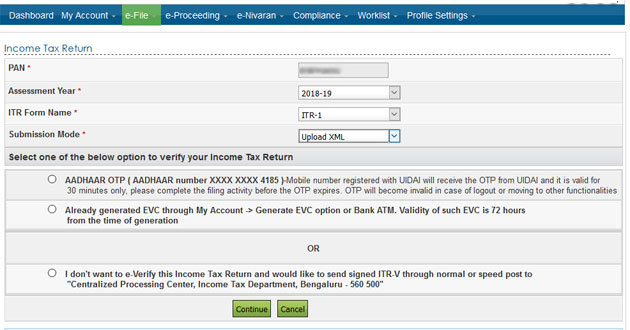 f. After submission, the taxpayer can e-verify using Aadhaar OTP option or EVC option generated either through net-banking, bank account, demat account or bank ATM (for selected bank only).